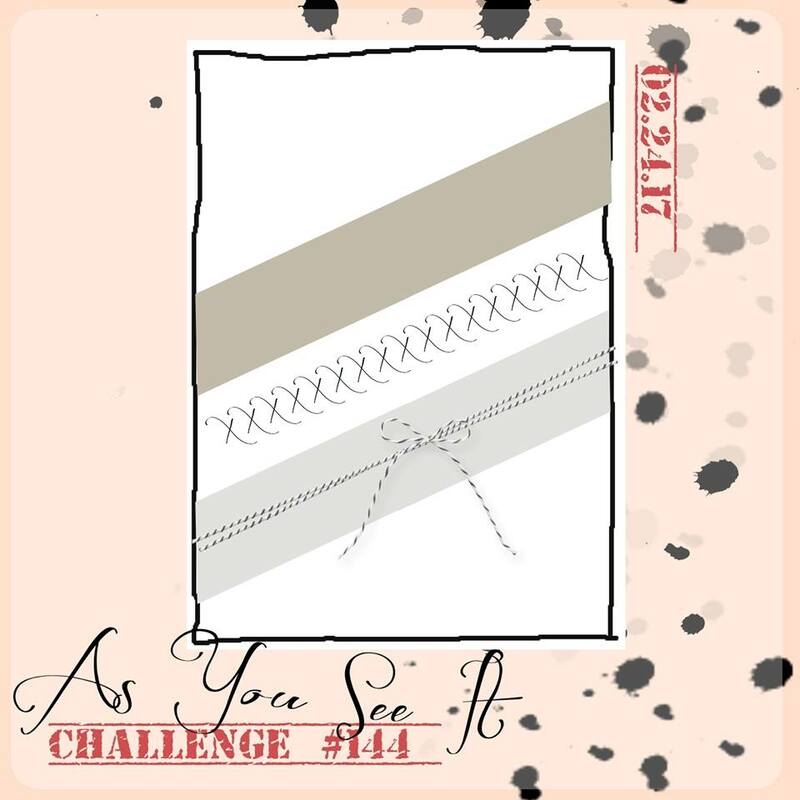 When we decided to make As You See It Challenges a two week challenge, it seemed like gobs of time, but I can't believe how fast that time flies by. 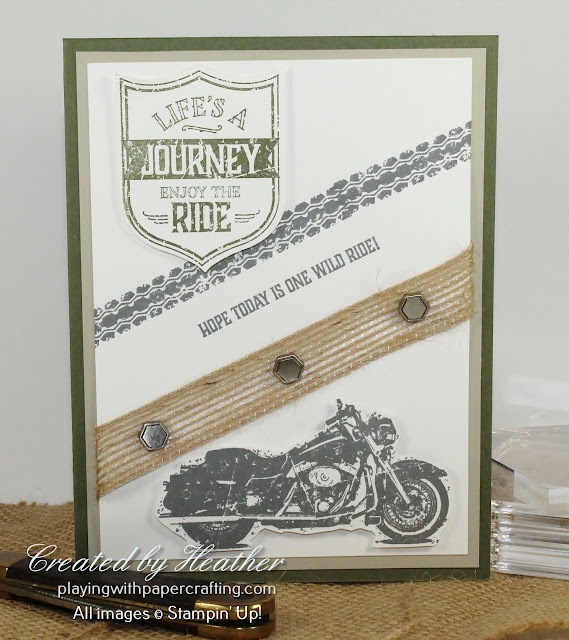 It's already time for our newest challenge and Amanda has given us a great one again. And I used Always Artichoke!!! When does that happen these days?? It's been ages since that poor stamp pad has seen the light of day! But it seemed just right for my One Wild Ride stamp set and Basic Gray with Crumb Cake and Sahara Sand for the perfect masculine card! This was one that I made on my retreat in Okanagan Falls last weekend. The diagonal stripes were accomplished with the motorcycle tire track, stamped in Basic Gray Archival Ink, and the 5/8" Burlap Ribbon with some Urban Underground Embellishments taking the place of the Baker's Twine. 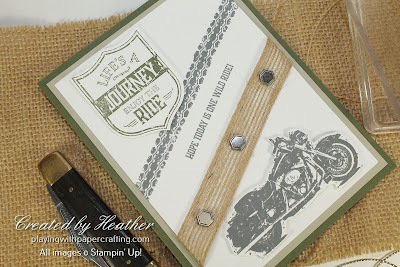 Unfortunately, the tire track stamp did not reach all the way diagonally across the page and I didn't bring my Stamp-a-ma-jig along with me on the retreat ( I know, I should never go anywhere without it - it was an oversight!) so I had to eyeball it as best I could. This was the best of about 4 different attempts. It's not perfect, but it's close enough - and I had a limited amount of Whisper White with me as well! 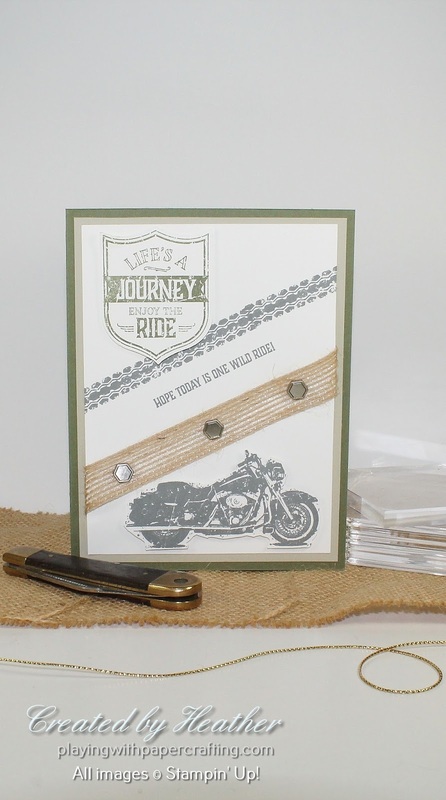 The sentiment is from One Wild Ride as well. It works well on the diagonal. The bike was stamped and fussy cut, then mounted on the card front with dimensionals. The badge at the top was stamped in Always Artichoke and punched out with my new Best Badge Punch. What have you got cooked up for the weekend? 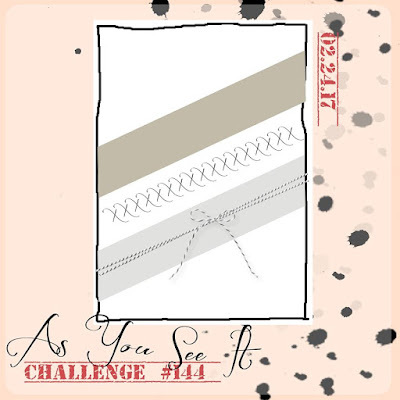 Why not spend some time in the craft room and enter our new challenge over at As You See It Challenges! You could win fame and fortune! Well...fame anyway! New SAB Rewards and Fun with 3D! Tasty Trucks with a Secret!